Double amount of export contracts and consolidated turnover reaching EUR 117 million — this is the last year’s balance of the industrial group of companies UPB. 2014 was the best year during the history of the company, claims Uldis Pīlēns, the biggest shareholder and Chair of the Board of A/S UPB. A remarkable growth has been observed in the total amount of foreign orders, there was a successful entry into the British and Swiss markets, and highly difficult projects have been realised. 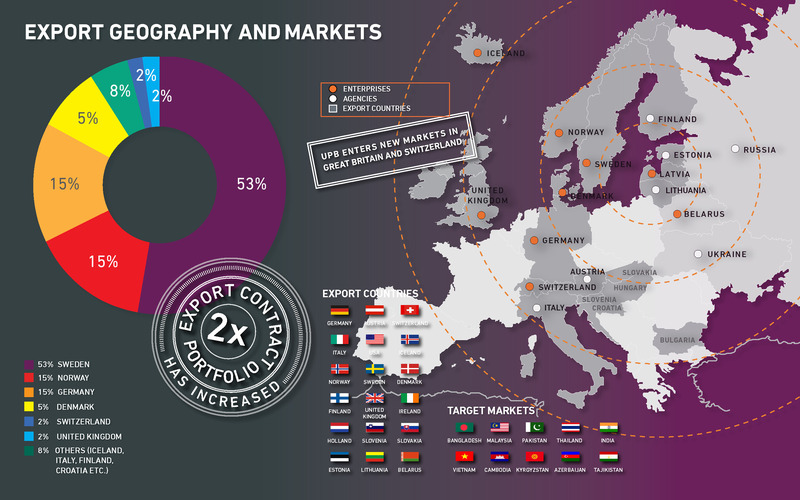 The group of companies currently includes more than 40 companies in nine countries, and export geography covers the whole Europe, while market research allows calling also Transcaucasia, South Asia and Indochina as potential markets. five-year plan of the group of companies.Although being a full-fledged participant of the common market is not a simple task as it requires not only extremely high-quality performance but also intellectual and engineering effort, the basic market still will be Europe, stresses the entrepreneur. The return can be seen both in contracts concluded in 2014 and planned in 2015 — the objects where UPB works are getting more and more complicated and bigger. At the same time the group of companies is trying to maintain the overall turnover proportion at the level of 60% export and 40% local market. Last year UPB has worked in large objects in Latvia, like Riga International Airport, Ventspils Technical College, Vidzeme Concert Hall, and others. In addition, a new office was established in Riga for the construction company “UPB nams”. 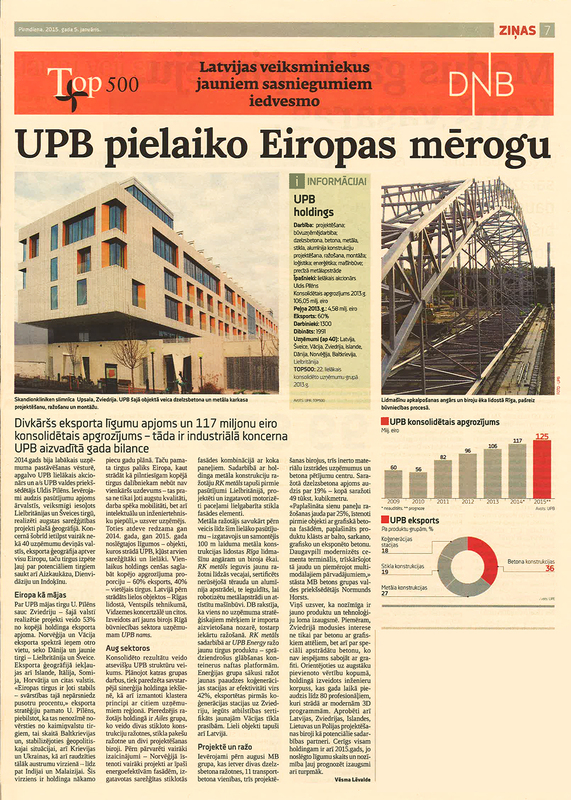 The consolidated result is built up by the performance of separate UPB’s structures. When works of each group are planned, the mutual synergy within the group of companies is taken into consideration and also cluster principles are used for the cooperation with other companies in the region. An experienced manufacturer within the group of companies is “Aile group”, which consists of two glass structures production units, PVC glazed structures production unit, and two designing offices. Last year the company has overcome several challenges — a number of especially energy-efficient façade projects have been implemented in Norway and complex wood glazed structures have been produced. In cooperation with the group of companies’ metal construction producer “RK metāls”, the first orders in the United Kingdom have been placed and large motorised liftable glass façade elements have been designed and produced. Last year the metal producer has performed the largest ever order — production and installation of metal constructions with 100 m span for an airplane hangar at the Riga International Airport and office building. “RK metals” has acquired a new production unit right next to the previous one, has received a certificate for processing stainless steel and aluminium and invested in automation of metal processing and development of engineering industry. “DB” has written that one of the strategic goals of the company is substituting of import in the sector, including in the manufacturing of machinery. In cooperation with “UPB Energy”, “RK metāls” manufactures a new market product — explosion-proof saving containers on offshore platforms. The “UPB Energy” group has launched production of new-generation CHP plants with efficiency reaching above 42%, the first CHP plants have been exported to Sweden, and certificate of compliance with the new requirements of German power grid has been received. Large projects have been implemented also in Latvia. Last year the “MB betons grupa”, which comprises two reinforced concrete production units, 11 transit-mixed concrete units, three engineering offices, three companies developing inert materials, and a concrete study centre, has experienced a remarkable growth. The amount of produced reinforced concrete has grown by 19% to 49 thousand m3. The production volume of wall panels has been increased by 25%, the first projects involving graphic concrete façades have been implemented, and the product range has been supplemented with the white, red, graphic, and exposed concrete. Daugavpils’ concrete terminal has been modernised, as a result of which its capacity has tripled and it is now adapted to multimodal shipments, reveals Normunds Horsts, Chair of the Board of “MB betons grupa”. He points out that the role of new products and technologies in development cannot be under-evaluated. For example, in Sweden the interest has grown not only in concrete with graphic images but also specially processed concrete which is impossible to be ruined by graffiti. Aiming at higher value added in general, an engineering corps has been established within the group of companies; over a year this corps has grown up to 80 specialists working with up-to-date 3D programs. In addition, engineering offices in Latvia, Sweden, Iceland, Lithuania, and Poland have been approved as potential cooperation partners. The group of companies is expecting that also 2015 will be successful, since the number and importance of contracts concluded allows predicting growth also in the future.